While soy is to be avoided on this diet, when it’s fermented and its protein/lectins are broken down by the beneficial bacteria doing the fermentation, it becomes an acceptable ingredient. Tamari (wheat-free) soy sauce for example is used by many Paleo dieters, while natto (fermented soy beans), and soy-based gluten-free unpasteurized miso paste are all considered very good for our health. Tofu on the other hand is very processed, and it still carries loads of agglutinin (SBA), so it’s not an acceptable food in the Paleo-sphere. Unfortunately, you won’t be able to find these ingredients in all countries, especially the unpasteurized miso paste. Most miso pastes are pasteurized, so their cultures are dead, making miso itself useless. In my local Japanese food store I only found one product that was unpasteurized, and many more than weren’t. Also, make sure that your miso does not contain grains/barley. 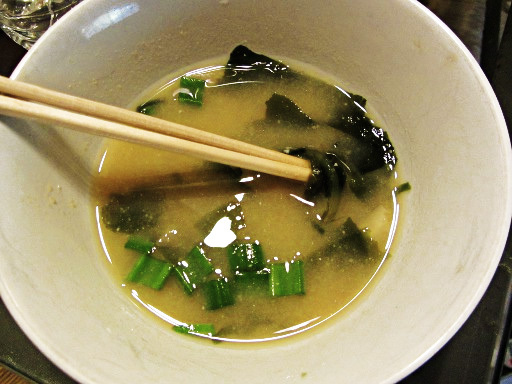 This miso soup is very easy to make, and very healthy because it includes various bone minerals, the miso live culture, and iodine & other rare minerals found only on sea-vegetables. My husband usually dislikes miso soup in sushi restaurants, but he loved this one (he asked for a refill, rare for him). 1. Place the dried sea vegetables in warm water, and let them stand for 10 minutes. Then rinse them well. 2. In a saucepan add the water, under medium heat. Using a tea cup, submerge it to the warm liquid and remove about 1/3 cup of it. Set aside the cup. 3. Add the sea vegetables and mushrooms in the saucepan and bring into a boil for about 5 minutes. Remove from fire. 4. Add the miso paste into the warm-ish water in the tea cup and try to liquify the paste using a teaspoon. It’s important for the water in the cup to not be very hot, or the active culture will die. 5. When the soup in the saucepan has cooled down a bit (warm, not hot), add the chopped green onion, and the now-liquid miso paste. Mix well, serve immediately, possibly with some sashimi!